Drive Birds Away with Pulsing Strobe Explosions with the New Bird-X Bird Lite. 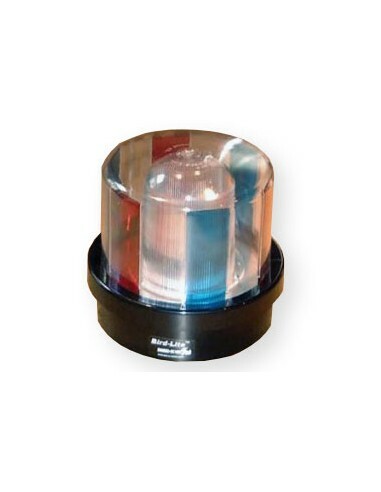 The all-new MULTI-COLOR Stroboscopic Bird Lite from Bird-X chases birds off your property and keeps them away. Bird Lite sends out intimidating, intense white, red, blue and amber light at 75 flashes per minute. One-million-candlepower light pulses (and the frightening shadows they create) at this frequency are intolerable and disorienting to birds, causing them to fly away from the source of annoyance. Most effective in dark or dimly-lit buildings. When installed at heights where pest birds normally roost and nest, Bird Lite is barely noticeable to workers at ground level. Covers up to 10,000 ft per Bird Lite in factories, warehouses, hangars, granaries or any large, dark or dimly-lit area where birds create a nuisance. Join hundreds of America's best known firms who have solved their indoor bird problems easily and economically with the Bird-X Bird Lite. * Best of all Bird-X Bird Lite IS ECONOMICAL ! Factories, warehouses, hangars, granaries, tunnels, loading docks, breezeways, boat houses, underpasses, storage sheds, barns, sport arenas, convention centers, parking garages, car washes or any large, dark or dimly-lit area where birds create a nuisance. 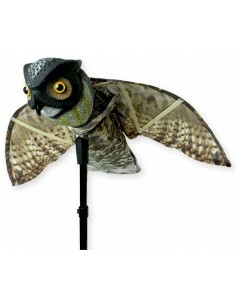 Bird-X Bird Lite Size: DIAMETER - 8"; HEIGHT - 7 1/2"
Bird-X Bird Lite Shipping Weight: 5 lbs.